Scaup can be confusing, no matter what your birding skill level is. Living in the mountains of West Virginia, we tend to have our sightings few and far between. Therefore, it is tougher to get embedded into your brain here; more so than in other locations. During normal years, most of the scaup we see are Lesser Scaup (Aythya affinis) they are our most common and expected species. I usually expect to see a couple of Greater Scaup (Aythya marila) every other year or so. We all have figured out by now that the winter of 2013-2014 was not normal. The Great Lakes were nearly completely frozen over and this had a major effect on waterfowl travel. We were blessed with more Greater Scaup than Lesser Scaup and I was privileged enough to be able to get several photos of both species in the same frame. Sometimes things just work out, not often but sometimes. 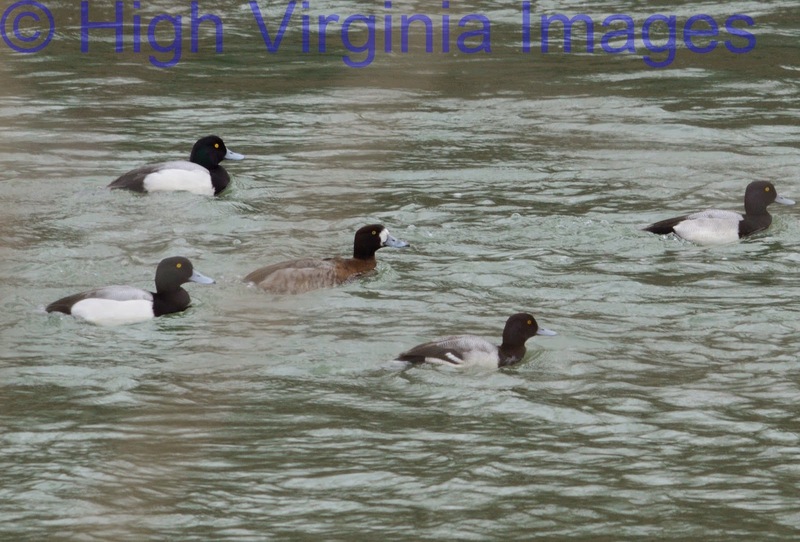 This next photo show a Lesser Scaup in the middle. Notice the shape of the head, shape of the bill and the barring on its flanks. I felt very lucky to get these shots. Distance, lighting and weather always seem to hinder our views, but etching things in our mind always make us more confident. This was the first time; as far back as I can remember that I have ever seen both species together in the mountains of WV. I actually took some half-hearted photos of these earlier in the day; thinking they were all Lesser Scaup. I happened to look at the photos later in the day and realized that I actually had some bad Greater Scaup shots. I rushed back to the location and they were actually still there. April brings us hope. The winter of 2009-2010 fades from memory. 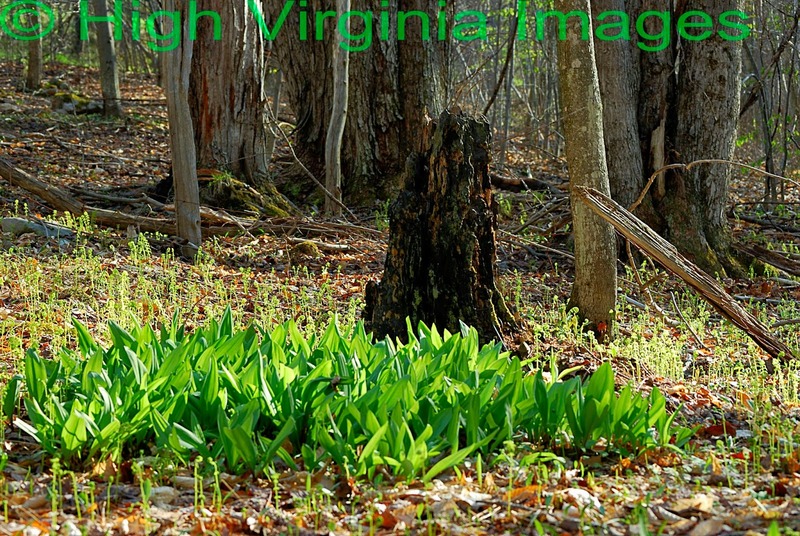 Melting snow triggers the emergence of morels and ramps. The run-off from the massive snowpack is well on its journey to the Mississippi Delta. Streams return to normal flow. Songbirds return, turkeys gobble and fish become active. It happens every year. Most of you live in the area where spring begins in April. Where I live and play, spring doesn’t begin until May. There isn’t much difference in the mountains; between March and April, except for a few more teaser days. Yeah, I know that the official date of the Spring Equinox is March 20. That is OK, if you live in the Deep South. My belief is that it isn’t spring, until I see my first hummingbird of the year. The only thing that I have to complain about; regarding spring, is that it doesn’t last long enough. Back in the days when gas was cheap and life was good, I became spoiled. I knew that I would be in a palmetto swamp; in Macon County, Alabama on March 20. My job was guiding turkey hunters at one of the premier hunting lodges of the South. Turkey season ran until April 30. Alabama’s spring didn’t quite last that long. Sweltering summer heat usually began around the third week of April. I could always tough it out, knowing that I would be arriving in the Allegheny Highlands just in time for spring. I would hunt in the mountains of West Virginia and Virginia and follow spring north, usually ending up in New York or Vermont as the dogwood blossoms faded away. What is the first thing you think of, when you hear the word spring? I think green. Not just any green; the green of emerging leaves. I then have an image of white; no not the white shimmer of snow that we have all grown tired of, the white bloom of serviceberry and the dogwood florets, with edges of brown. Honey bees on crocus bloom. The chorus of singing toads, gobbling turkeys and the dreaded irritation of a string-trimmer are all sure signs of spring. I think of the smell of freshly mowed grass and the aroma of bacon and ramps, wafting from a streamside campsite. I think of activity. People, who haven’t been visible; during the previous five months, magically appear in their lawns and gardens. Birds busily gather materials for nest building. The woods come alive with song. Aquatic insects awaken from near dormancy, their activity increases with each rising degree of water temperature. Fish begin feeding after the long winter; gaining strength for the upcoming spawns. These are a few of my thoughts of spring. I hope they make you think of flowers, baby birds and warm spring rain. Spring is without a doubt, my favorite season. I would be happy if summer’s heat never arrived and the dull gray days of winter only lasted for a few weeks. Now, I believe I will take my Vitamin D pill and start doing my taxes. This article first appeared in Two-Lane Livin April 2010. Everyone knows that our Eastern Chipmunk disappears when the cold winter winds blow. Did you ever wonder how a chipmunk’s life could be compared to those of the human race? The chipmunk hibernates during the winter months but it is not a period of continuous inactivity. Things are happening down there; below the frost line. Our little furry friend builds a burrow system that contains food storage chambers, a bathroom chamber and a sleeping chamber. The entrance to the burrow is plugged with leaves for insulation and camouflage from passing weasels. Life goes on down there in that tiny little apartment throughout the winter. 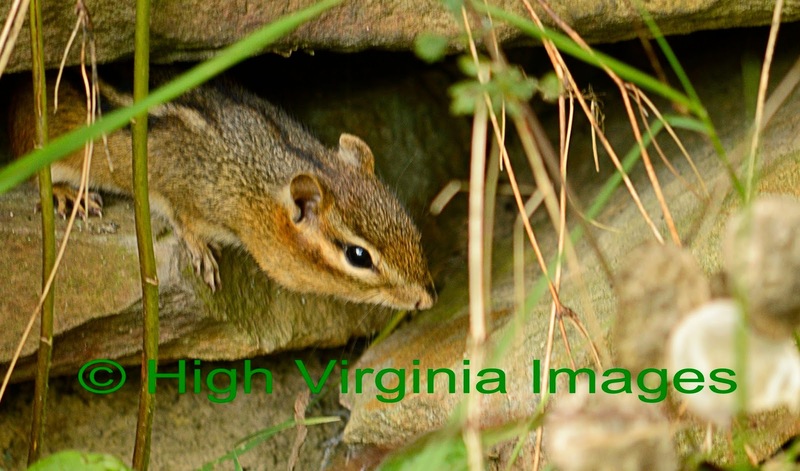 The chipmunk’s body temperature lowers to that of the air temperature in the burrow. Usually this temperature is around 40 degrees and the little mammal begins to take long naps. Unlike the bear which stores body fat for the winter; the chipmunk awakens from time to time to consume calories from its pantry. The chipmunk has a unique ability to raise its body temperature. Every few days it raises its body temperature to around 94 degrees; gets up, visits the bathroom chamber, snacks and goes back to sleep. If it happens to feel a warm breeze coming through the burrow; it may pop its head out of the burrow entrance and soak up a few rays from the sun. This cycle is repeated over and over throughout the winter months. By now you are wondering how this applies to humans. I myself have no love of the winter season. I’ve had enough of it by the time the New Year rolls in. There are always those who proclaim their love of winter. They always get me wondering; do they love the frigid temperatures, the icy roads, winds blowing the stinging icy snow pellets sideways, zero visibility, frozen fingers or seeing the antennae on their vehicle grow to the size of a shovel handle; maybe they love the thrill of sliding down the road uncontrollably, just hoping to stop. No, they love winter; two days after the storm has passed. They love to clear blue skies that follow and the fluffy white snow. They love traveling on the clear dry roads on which over the previous two days workers have risked life and limb to clear for them. They love going to the grocery store and talking about that last storm they endured; while they watched through their picture window. Yes, they love winter just as the chipmunk loves winter. It isn’t too bad if you’re not out there in it. The little chipmunk doesn’t have to worry about hawks, foxes or house cats or anything else; while locked in the safety of its burrow. Myself; I’m waiting on spring green and am not in any way afflicted with the chipmunk syndrome. Thinking of Spring! I guess we've made it again. There is a dim light glowing at the end of the tunnel of frozen tundra. There are a few teaser days on the distant horizon. I have a love-hate relationship with those teaser days. I’m always glad when the show up but I know they will not stay. I consider downtime to be the period between my last day of deer hunting and the day I put my potatoes in the ground. I know that between the times those tubers are covered with soil and it turns hot; there will be 3 or 4 pleasant weeks. Those weeks are known as prime-time. I spent a lot of time this winter researching underwater insect life. I decided to limit my fishing during the spring to using sub-surface flies that actually look like the things that really live down there. I have stared at so many photos of caddis larvae, stoneflies, mayflies and diptera that I can almost say some of their scientific names. I do believe that I have learned about all I need to know about them. I now understand where each species can be expected to be found in any stream. I sure know more about the bottom of the stream than I did at this time last year. That is a good thing. Part two of the process was a long and hard search to find imitations the really looked like what they were supposed to imitate. We all know that many patterns are tied to resemble real things; but they are also tied to attract the fisher’s eye and to get into his or her wallet. Believe me when I say that it is a challenge to find exactly what you are looking for; especially with satellite internet that will not stay connected. I do believe I managed to find realistic imitations of most of what I was looking for. It wasn't easy and it wasn't cheap. The caddisflies I concentrated on were mostly netspinners (Hydropsychidae) and the green rock worms (Rhyacophilidae) these live in the type of water that I like to fish. The colors are primarily tan and green; I believe those two colors will pretty much cover my applications. I concentrated on finding realistic patterns for common stoneflies (Perlidae), since these are the most available stoneflies in the streams I fish. I already had plenty of Hendrickson, Sulphur, Blue-winged Olives Green Drakes and Isonychia nymphs; so the mayflies were covered. I didn't bother with midge larvae; I could never get one of those tiny things tied on a leader. The only True Fly (Diptera) I ended up buying were some large weighted nymphs that look like crane fly larvae. I believe I’m set for the season, only time will tell. I do know that if the realistically researched nymphs fail; those trusty Clouser Minnows will be in my pocket. No worries there. Now, all we can do is wait for those nice days to be out on the river. We never know how many times we can get out there and we never know if each one will be the last. Therefore we need to take advantage and enjoy the time we have. Never quit learning, you will have no regrets.